Southern cooks and barbecue pitmasters may want to skip right past this recipe, because it’s a bit of a Southern cooking sacrilege, per The Blue Bloods Cookbook. It is an American police procedural fictional drama following the Reagan family of police officers with the New York City Police Department. Frank Reagan, played by Tom Selleck, is the Police Commissioner. His oldest son Danny, played by Donnie Wahlberg, is an NYPD detective, his youngest son Jamie, played by Will Estes, is an NYPD officer, now sergeant, and his daughter Erin, played by Bridge Moynahan, is an assistant district attorney. Frank’s second-oldest son Joe was murdered by a crooked cop in the line of duty in events that pre-date the series. Frank’s father Henry, played by Len Cariou, is a former NYPD beat cop who rose through the ranks to Police Commissioner. Each member of the family represents a different line of police work or the legal process, with each person’s story line occasionally interweaving with another’s. There are plenty of other characters, children and grandchildren in the show. The running feature of each show involves Sunday dinner around the dining room table in Frank Reagan’s home. Four generations of the family dine together and discuss their week. 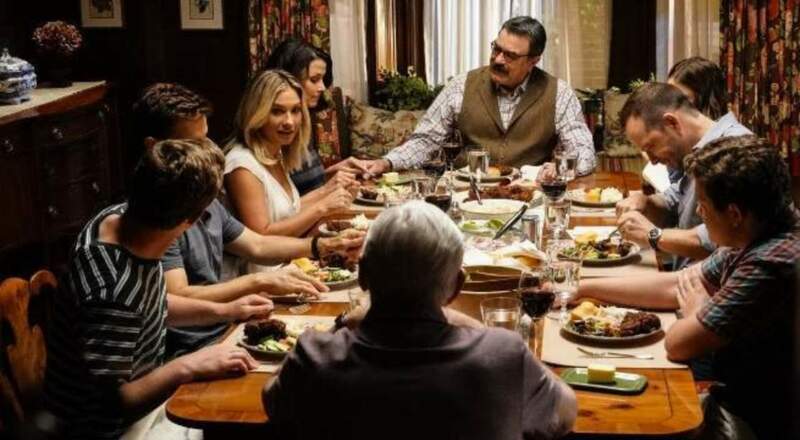 The rule of the dinner is that no one can take a first bite before every family member is present and seated, and grace is said. The Reagan family with newest member, Eddie (Jamie's fiancée) in the white blouse on the left. At times the conversation becomes heated and emotionally charged, they argue and fight, but the whole family remains loving and united regardless of any differences they may have. The Reagan family Sunday dinner has been a tradition for more than a century, and is well known to their friends and neighbors. I’m imagining this oven “fried” chicken would have been one of their meals. This great chicken recipe avoids the smelly mess and clean-up of deep frying chicken, and more important, avoids the unhealthiness of it. 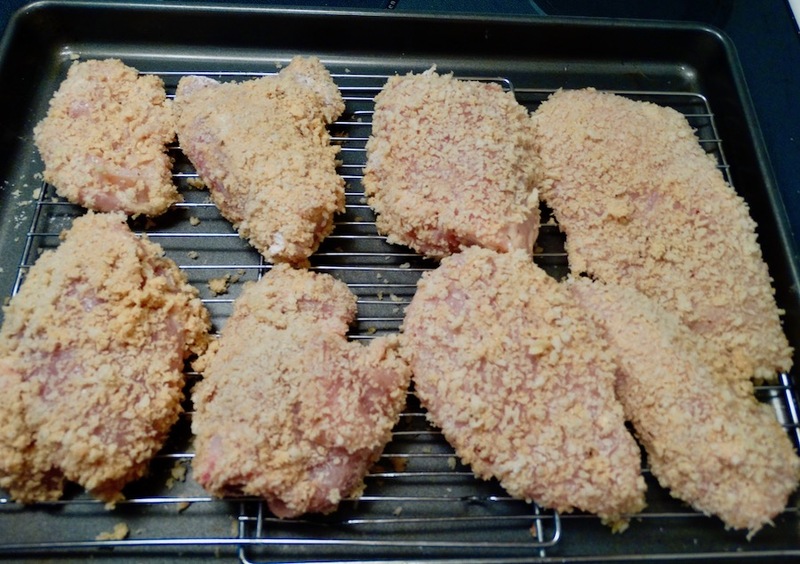 This recipe maintains the crunchiness of deep-fried chicken by breading it with panko bread crumbs and baking it for a good long time, you could substitute crushed cornflakes for the panko and achieve the same results. Dijon mustard was the surprising ingredient for me. It was perfect with the great blend of spices! This chicken is delicious, Bill really like it, and I will be making it again soon! Hope you give it a try! Many thanks again for a great cookbook, Bubba! Rinse chicken pieces and pat dry with paper towels. In a small bowl, season flour liberally with salt and pepper and whisk to combine. In a large bowl, combine buttermilk, mustard, oregano, cayenne and paprika. Spread the panko crumbs on a plate. Dredge each piece of chicken in the flour, shaking off excess. Then dip into buttermilk, coating it thoroughly and letting any excess drip off. 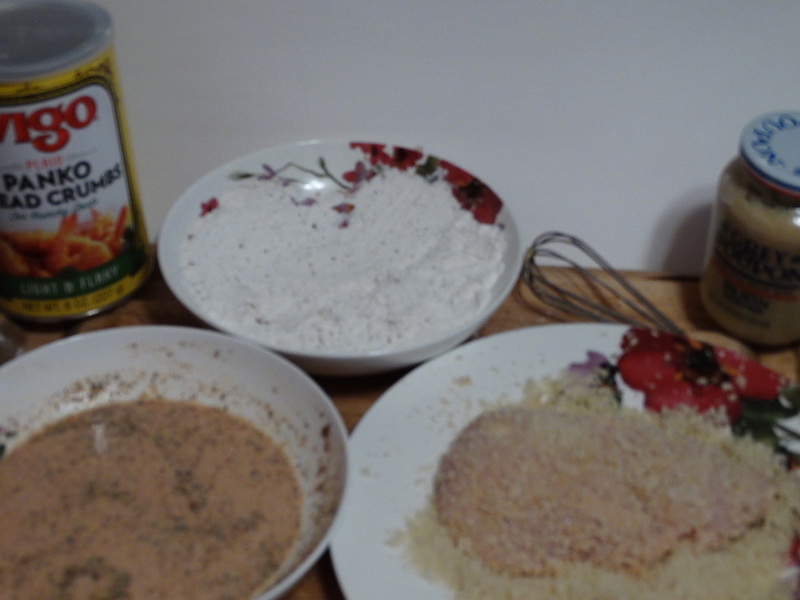 Then press the chicken into the bread crumbs, rolling until completely coated. Repeat the dredging process with all the remaining chicken. Place a wire rack on a baking sheet and space out the chicken on the rack. Bake for 20 minutes, turn the chicken. Lower oven temperature to 375°. Bake for 45 minutes more, or until the chicken pieces are dark brown, and interior temperature of chicken is 165° on an instant-read thermometer, and the juices run clear. Transfer to serving platter and let rest for 5 to 10 minutes. I like the show too! These baked chicken sound really delicious and seem relatively easy to prepare. A perfect dish for any family gathering! Hi Angie! I really like it too! And the chicken was delicious! Thanks! I am also a big fan of Blue Bloods. Your chicken looks very good and we'll have to give it a try. Great, Larry! There's always something different going on with the show to make it interesting to watch. Hope you like the chicken if you try it! A son's cookbook gift - a family TV show around a Sunday dinner table - a baked chicken recipe . What a perfect triangle to post about! Thanks, Duta! It's all good! Thanks and take care. Hi Diane! That's interesting! If I don't have buttermilk on hand, I add 1 tablespoon lemon juice to a cup of milk and let it stand for 5 minutes. The milk will get thicker and clumpy and is ready to use in any recipe calling for buttermilk. Did you find a farmer? 😊 Have a wonderful rest of the week! Hi Dave! I'm hanging in! We are going through another really cold spell, more snow and ice, and sleet the last couple of days. And the wind---that's another story! Can't wait for Spring!!! But it's supposed to be 40° tomorrow for Valentine's Day! This chicken was really good, best part, not messy! Have a great rest of the week. We've been debating about what to have for dinner tomorrow and this just won!!! Sounds terrific! This TV show sounds really interesting. Your chicken dish sounds fab - and I like that it is baked, not fried. Yes, as I said, I love the show! Lots of action, and drama and family. 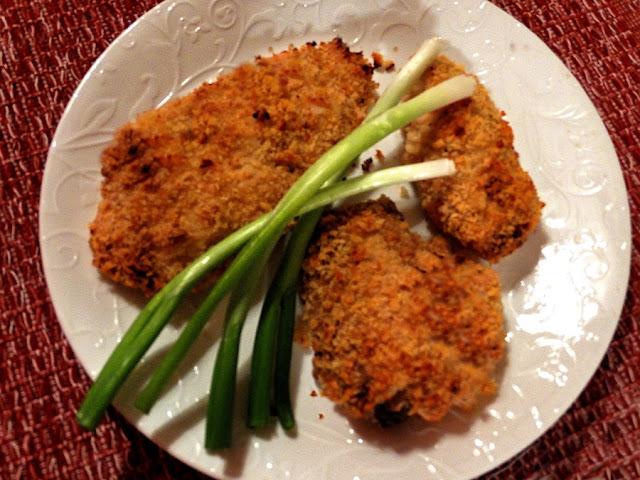 I love fried chicken but don't make it, so this is a great substitution! Thanks! Yes, it is natalia! And the series is great! Thanks! I love Blue bloods !! A d thid recipe looks delicious Pam ! Woo hoo, Gloria! Glad you're a fan too! It's a great entertaining show! Thanks! I love your Christmas gift and the chicken sounds really delicious. My husband and I both enjoy watching Blue Bloods! I'm still upset about Linda and wonder when Danny will eventually fall in love again. This show sounds great! And why did I think you weren't writing anymore? I am so sorry, but I'm sure glad I discovered you again! So ready for this chicken! 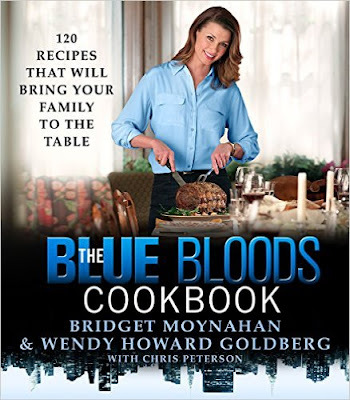 We are so far behind on our Blue Blood episodes! Thanks for the great reminder. They always eat so well at their family dinners. Love this baked chicken - I bet it is tasty. Great gift from your husband - I'll have to check it out! Baked fried chicken! Looks so delicious! Hi Joyce! Yep, it's good! Thanks for the visit! Sounds like a fun TV program! And this sounds like a TERRIFIC dish! Love fried chicken -- who doesn't? -- and this baked version makes for a less messy preparation. Winner! Pam, I have a confession to make. I've never seen Blue Bloods. I had to Google it to learn more. It must not be on the air over here as I haven't seen it. That oven fried chicken looks great. We're trying to cut out fried food as much as possible, so this looks great for our plate. Oh, sorry you're missing great show, it's in its 9th year and is going strong. The chicken is really good esp with cutting calories. Thanks, Ron! My husband loves that show, but I think he's already seen every episode (maybe not just once). I'm tempted to get him the cookbook! The cookbook is great, Mae, especially for your husband who is a fan of the show, maybe he would really enjoy it. It's an easy show to get hooked on and so is the chicken. Thanks and take care. I absolutely love the idea of baking and not frying...specially if the chicken taste like fried...thanks for sharing the recipe. I will check on the show...thanks for the introduction. Have a great week Pam! Hi Juliana! Yes all the way, chicken and baking, delicious! Have a good day! 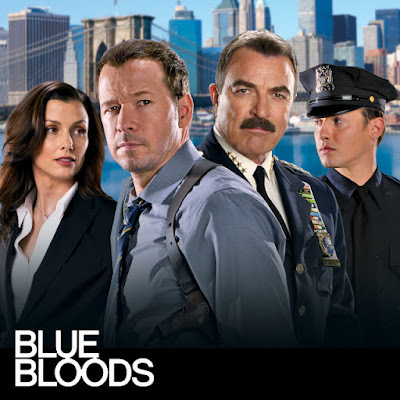 Blue Bloods......one of my favorite shows... I think one of the big things that I enjoy about this show is the family sitting down for dinner and enjoying family discussions. The chicken recipe looks amazing. Such a thoughtful gift! I love a lot of the actors in this drama. We just don't watch a lot of network series anymore. This chicken sounds amazing. Great flavors and I love the baking technique! Thanks! Hi Debra! Yes, there are very few network series I watch and this one is great! Baking is good too! Thanks! Delicious ~ One-Skillet Italian Sausage Pasta!